During these times of economic uncertainty, hunger and the threat of hunger is growing in Galveston County. What has been and continues to be one of the greatest challenges facing economically disadvantaged people is accessing and purchasing healthy foods. What has changed over the past decade is the “face of hunger” or who is in need of food. Galveston County comprises of twelve cities, one village, three designated areas and six unincorporated areas, including four of which are located on Bolivar Peninsula where Crystal Beach Community Church is located. With a county population of 314,198, according to the 2014 Census, 14.3 percent of the population lives in poverty and 24.7 percent of those residents are under 18. Nutritious meals are also vital to a child’s overall well-being. Crystal Beach Community Church is the local host for the Kidz Pacz Outreach program where children receive healthy meals all year round. For many children, the only meals they eat each day are provided at school, the Food Bank ensures that children are still able to receive nutritious, kid-friendly food through its Kidz Pacz program. 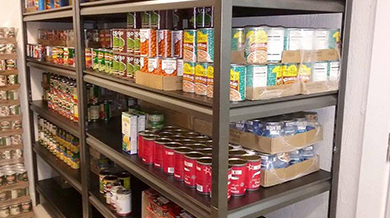 The church Food Bank is open on Thursdays, from 10:00AM – 2:00AM by trained and certified volunteers in Food Handling Requirements. By the generous offerings, the food is distributed at no cost but proof of residency is required.